Matt Learns to Read is a 26 page children's book about a young boy who is walking to his first day of school where he anticipates he will learn how to read. This colorful children's book was written by a committee of speech-language pathologists who accumulated many years working in the areas of language and literacy and who incorporated essential ingredients for the development of literacy skills in the emergent reader. The purpose for the creation and distribution of the book was to heighten public awareness about the role of speech-language pathology in the area of literacy and to provide literature to children who might be at-risk for developing literacy skills. TSHA members may request up to 25 copies for their personal use. Copies exceeding the 25 copy limit will need to be approved by the VP of Public Information and Marketing. Click Login to view purchase options to order the English version. Click Login to view purchase options to order the Spanish version. In December 1996 members of the Texas Speech Language Hearing Association's (TSHA) Executive Board heard former Governor Bush express his concerns about literacy in the state of Texas . Literacy statistics in Texas were alarming: 28% of adults lacked basic literacy skills; 3.3 million people were considered to be functionally illiterate; 1 in 4 Texans lacked basic reading and writing skills; Texas ranked 47th in literacy among the 50 states; one-third of Texans dropped out of high school before graduation; 92% of women on welfare did not have a high school diploma; and, 86% of inmates in Texas prisons did not have a high school diploma. The estimated cost of illiteracy in Texas was estimated to be over 17 billion dollars a year! As a response to Governor's Bush' concerns about the literacy problems in Texas, TSHA created the Literacy Effort task force in April 1997. Judi Keller, TSHA's 1997 Vice-President for Public Information and Marketing, chaired the TSHA Literacy Effort task force. Committee members included: Cynthia Campbell, Terri Haynes, Ann Shaw-King, Carolyn McCall, Martha McGlothlin, Julie Noel and Martha Wristen. The task force established two goals: write a children's book to be distributed among pre-school age children throughout the state of Texas and create a brochure for caregivers, informing them about the importance of reading to a child at an early age. Both the book and the brochure would be published in English and Spanish. The English translation brochure for caregivers, “Learning to Read Is a Family Affair” was published in February 1998. To promote the importance of speech-language pathologists being involved in literacy, the task force presented on multiple literacy topics at the 1998 TSHA Convention held in April. 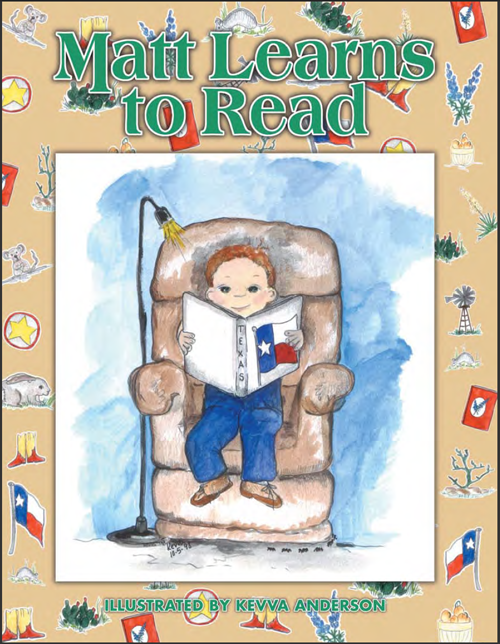 In October 1998 the English translation of the children's book Matt Learns To Read was published and the first 100 copies of the book were presented in November at the ASHA Convention to the San Antonio “Reading Is Fundamental” organization. The Spanish translation of the “Learning to Read Is a Family Affair” brochure was published in March 1999 followed by the Spanish translation of Matt Learns To Read being published in April 1999. Since publication of Matt Learns To Read over 30, 000 copies of the book have been printed. Matt Learns to Read is a 26 page children's book about a young boy who is walking to his first day of school where he anticipates he will learn how to read. His friend, Rosa, walks with him and along the way he is introduced to environmental print messages that heighten his awareness of the importance of written symbols. This book is filled with the indigenous flora and fauna of Texas. This colorful children's book was written by a committee of speech-language pathologists who accumulated many years working in the areas of language and literacy and who incorporated essential ingredients for the development of literacy skills in the emergent reader. Support for the project came from the Texas Speech-Language-Hearing Association, Scientific Learning, Incorporated and the Texas Interagency Council on Early Childhood Intervention. The book has been distributed free-of-charge to children enrolled in Early Childhood Education programs throughout the state of Texas. The purpose for the creation and distribution of the book was to heighten public awareness about the role of speech-language pathology in the area of literacy and to provide literature to children who might be at-risk for developing literacy skills. Support for inclusion of literacy within the scope of practice for speech-language pathology is well supported. The International Dyslexia Association adopted the following definition of dyslexia in 1994: Dyslexia is one of several distinct learning disabilities. It is a specific language-based disorder of constitutional origin characterized by difficulties in single word decoding, usually reflecting insufficient phonological processing abilities. These difficulties in single word decoding are often unexpected in relation to age and other cognitive and academic abilities; they are not the result of generalized developmental disability or sensory impairment. Dyslexia is manifest by variable difficulty with different forms of language, often including, in addition to reading, a conspicuous problem with acquiring proficiency in writing and spelling.